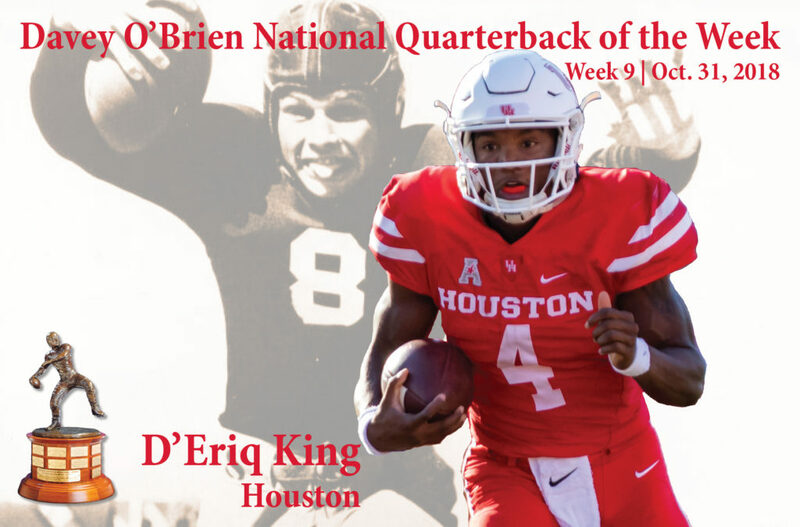 FORT WORTH, Texas (Oct. 31, 2018) – Houston’s D’Eriq King has been voted the Davey O’Brien National Quarterback of the Week for week nine, the Davey O’Brien Foundation has announced. On Saturday, King led the Cougars to a convincing 57-36 victory over previously unbeaten and 21st-ranked USF. He amassed 551 total yards and accounted for seven touchdowns, five passing and two rushing, against the Bulls. Through the air, King completed 28 of 40 passes for 419 yards. He added 132 yards on the ground on just 12 carries. King has also been named the Walter Camp National Offensive Player of the Week and The American Athletic Conference Offensive Player of the Week. On the year, the native of Manvel, Texas, leads the nation in points responsible for (236). King also ranks among the NCAA’s top 10 in total quarterback ranking (3rd, 87.6), passing touchdowns (3rd, 28), total offense per game (4th, 352.0), passing efficiency (6th, 173.0), passing yards (6th, 2,403) and rushing touchdowns (6th, 11). The Punt & Pass Podcast hosted by Drew Butler and Aaron Murray will discuss King’s achievement on Thursday’s edition of the show. The other Great 8 quarterbacks in the season’s ninth week were: Taylor Cornelius of Oklahoma State, Syracuse’s Eric Dungey, Nick Fitzgerald of Mississippi State, Georgia’s Jake Fromm, Jordan Love of Utah State, Washington State’s Gardner Minshew and Kyler Murray of Oklahoma.